When you ring in another birthday, it usually involves one too many shots and a fun confrontation with your own mortality. But when the Frappuccino does, it means fancy limited-run coffee for everyone. 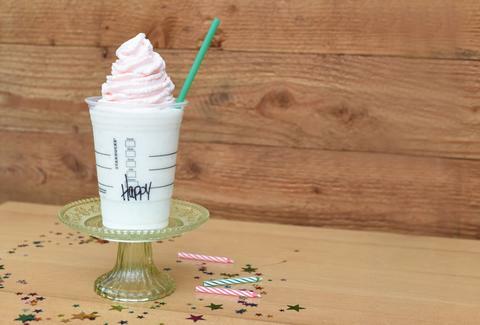 Beginning today, Starbucks will offer a special Birthday Cake Frappuccino to celebrate the drink's 20th anniversary. While it sadly doesn't include any floating cake chunks, it does feature a blend of vanilla bean and hazelnut flavors, and is topped with a raspberry-infused whipped cream. It's only around until March 30th (that's next Monday), so grab your emergency sprinkle dispenser and get going. Kristin Hunt is a Food/Drink staff writer for Thrillist, and wonders if Starbucks will make a booze-infused Frappuccino next year for its 21st birthday. Follow her to Irish coffees at @kristin_hunt.